Drew Lock finished the first half going 26-of-36 for 402 yards and five touchdowns. J’Mon Moore scored four times on eight catches for 114 yards. Emanuel Hall added a touchdown and 122 yards. Dimetrios Mason added eight catches for 120 yards. The Tigers held Delaware State to a total of 140 yards. Mizzou’s record for single game yardage was 722. 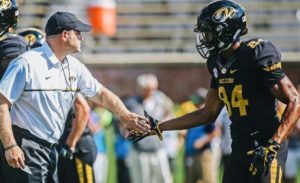 The Tigers came up short at 698, but Head Coach Barry Odom certainly changed the play calling and took the foot off the gas midway through the third quarter. –The 79 points beats the previous record of 69. The last time the Tigers scored 69 was in 2008 vs. Western Illinois. –It was also the first time since ’08 that three receivers had over 100 receiving yards. Today it was Hall, Dimetrios Mason and J’Mon Moore. –Senior LB Michael Scheer came up with his first interception. –Junior DE Jordan Harold recorded his first sack. –Sophomore P Corey Fatony completed his first pass, when Mizzou ran a fake in the first quarter.